Despite the political turmoil and war-ravaged state the country is only just emerging from, Iraq remains a fascinating place from a traveler's perspective even if it will take some time before it is open to tourism again. 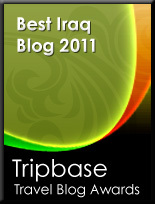 In the Iraq category of the Tripbase Awards, these winning blogs allow you to vicariously experience a country which is difficult and dangerous to visit. Iraq has remained in the center of political happenings for many years, and is currently off limits as a general tourist location. Tourism visas are not being granted and the current political status is considered ‘war zone'. Despite many important historical sites that Iraq has to offer, many travelers won't get the opportunity to visit anytime soon. Modern sculptures and buildings are mainly in Baghdad and were commissioned by the previous leader, Saddam Hussein and his government but cannot be visited without extreme danger to foreign travelers. Citizens enjoy the sport of football as a past time, and have produced a range of tasty foods that are offered worldwide. A culture of theatre and arts has continued in spite of the difficult status of the country, including academies of art, music, and ballet. Baghdad is also home to many museums that showcase historical artifacts from ancient civilizations. Remains of structures can be seen all over the country dating back thousands of years to past societies, standing as a chronicle of Iraq's history. Considering its turbulent past and difficult present, Iraq and the goings on there remain an interest to people worldwide. The blogs listed below represent the best that we found highlighting all aspects of Iraq.